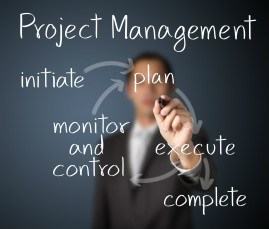 IT Project Management - TecGuard Inc. Implementation of technology solutions is where the rubber hits the road. It is where the upfront planning and design phases are given their acid test in reality. It is critical that at this point you are implementing the IT solution in a structured and controlled fashion using proven project implementation methodologies. If you do not have in-house resources and expertise to implement complex IT projects TecGuard will provide expert project management. Effective project management can often save a project from cost overruns, schedule delays and potentially failed projects. Using TecGuard as your project manager will free up your IT team to focus on core tasks.